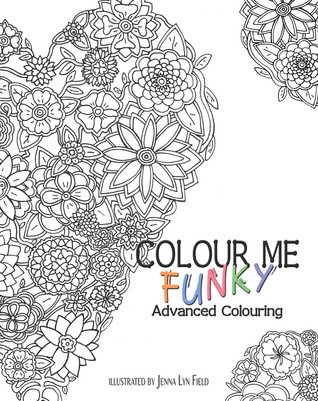 Immerse yourself in Colour Me Funky – Advanced Colouring. Fun for artists of all ages. With thirty pages of designs, all individually created just for you, Colour Me Funky – Advanced Colouring holds something to suit every mood and whim. I have coloured two and a half pages in this colouring book so far and am really enjoying it. It’s a joy to pick out a nice page and start colouring. 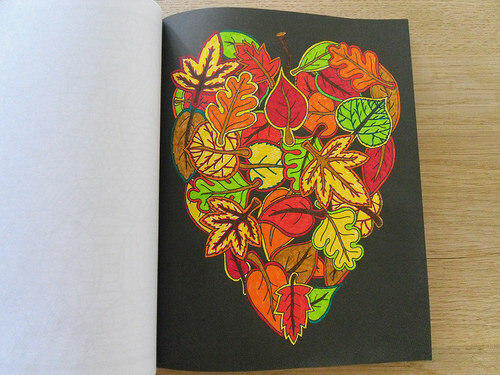 The colouring book looks small at first look, but there are a lot of pages in it and you can even colour the cover. The style of this author her drawings really appeal to me, I like her style and her drawings are fun. There are a few pages that didn’t really appeal to me, but I liked most pages. There is a lot of variety in this book, everything from fishes to leaves to flowers and more. There is not one theme, which makes for a fun colouring book as it works for different moods and you don’t easily tire due to the pages being the same. And even if there are a few pages you don’t like, chances are there are also a lot that you will like. There are a few pages that are similar, but then one has a black and the other a white background, which still gives them a totally different feel. This sit he first colouring book I used that has black pages, the drawings are in black and white like normal, but the background is all black, which gives the drawings a very different effect. I really liked trying out one of the black pages and I really liked it, it also felt a bit calmer on my eyes and it feels like the background is part of the drawing. There are both white and black background pages in this book, which again makes for a great variety. Another thing I like about this colouring book is how the pictures are printed only on one side. So on the other side of a drawing there is nothing, which means you don’t have to worry about your colours bleeding through the page and if you want to, you can remove a page from the book and hang it on the wall. The format of this colouring book is pretty much perfect in my opinion. A page takes me around 3 hours to complete. I’ve tried another colouring book before this one that had much larger pages, but I prefer this size. To summarize: I really like this colouring book, there is a lot of variety in pictures and different themes, which I liked. There are a few pages that weren’t my taste, but I liked most pages and had a lot of fun colouring in this book. There are some pages with a black background, which I hadn’t encountered before and I had fun trying out one fo these pages. The pages are printed on one side, so you don’t risk your pencils bleeding through and you can remove pages form the book if you want to. I liked the size of this colouring book as each page takes me about 3 hours to colour and I prefer this compared to larger pages. All in all is this a great colouring book and I would recommend it to everyone who wants to give colouring a try. Have you tried colouring? Which colouring books have you tried? I never read with a dark blackground on my tablet, but I might have to check if mine has that option too and whether I like it. Lola recently posted…Lola’s Ramblings: How do You Follow Blogs? I really like that this offers you both backgrounds. I’ve noticed that some of the pure white backgrounds are harder on my eyes. Have you tried the cream-colored backgrounds? They are so much kinder to my eyes. I just purchased a coloring book with black backgrounds from Amazon. They do make the colors really pop. I think I have one colouring book with cream backgrounds, but haven’t coloured a lot in it yet. The white background does look good, but it’s harder on my eyes than the black one. I really like the variety of this colouring book with both type of background. I would like to try out more black background in the future though as I really like them. What’s the colouring book you bought with the black backgrounds? It’s called Midnight Garden from Creative Haven. The pages are a little thin, so I slip a piece of cardstock behind them to catch the colors that bleed through, but it’s only printed on one side, so I don’t have to worry about it. And the pages are perforated, so they are easy to remove from the book. I’ll have to check that one out, it sounds like a good colouring book! I like colouring books that are printed on one side. I’ve seen a few colouring books with perforated page sin a local bookstore here, it sounds handy for wen you want to remove any pages or hang them on your wall. I haven’t colored in a coloring book since my daughter was little, about 15 years or so. I really enjoyed colouring when I was a kid and then stopped colouring when I grew-up. I am really happy to have given it a try again as it’s so much fun. I have not. I don’t think my husband would let me live it down ;/ unfortunately. I would love to have one heh, I been so curious about them. They are really fun and relaxing. There are a lot of fun colouring books around lately. Thanks :). It was a great colouring book and I liked that the pages were small enough that I could finish a colouring in a few hours. I have one book with mandala’s and while it’s really pretty it takes me so many hours to finish one, I get a bit impatient then as I want to see the end result. This one was the perfect size and the variety in pages was fun too. Ooh, I bought the Secret Garden and another adult coloring book. But I like that one with a black background. It’s so soothing and calming, isn’t it? I’m just very crappy when it comes to using color pencils. Maybe I should use crayons. I have the Enchanted Forest from the same author as the Secret Garden, I like her style too. The black backgrounds were so soothing and pretty! I really liked them. I usually colour towards the end of the day when I’ve done all the important stuff already and can relax. I love the black pages. Sometimes I color the background myself, so it’s nice to have it already done. I haven’t coloured the backgroudn myself yet, but that’s a good idea, although I would need other pens for that as with these that would takes ages. Having the black background makes it feel like the whole page is coloured, I like that. It sounds like someone has really thought out the features needed in a coloring book- one sided pages, variations in white or black backgrounds, and the variety of things to color. Love your samples by the way. Yes it feels like the author really thought things through about what aspects a good colouring book needed. The variety in designs and black and white background was great. And I prefer the one sided pages so I don’t have to worry about colours blending through. Love the work that you have done here!!! Seems like a fun coloring book. It seems perfect if I were to try out markers or pens!! I love coloring, its so fun and relaxing. I do like the idea of a black background though. That would be fun to try. I do love Johanna Basford’s books though, love her illustrations. I have her Forest book, I really love her art style. I haven’t coloured a lot in that book yet, if I have doen a few drawings I’ll review that as well. 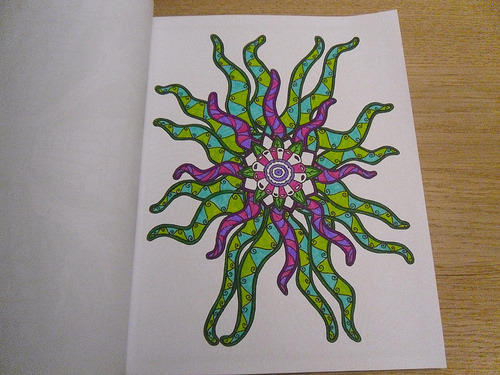 I really enjoyed this colouring book and it works great for markers and pens. The black backgrounds were fun to try :).